Welcome to the place where words come alive. Word World! I was sent this DVD to review a month ago. I think. I’m really not sure when it arrived because it went to the house we no longer live at and the new people that live there were kind enough to keep it and call up their realtor and he called my realtor and I went to pick it up at their house. They really are a nice family. That was way above what I would have expected anyone to do. Word World has become one of my favorite shows because it encourages the recognition of words. I’m sure my daughter can see that with all that she catches on to. I was first introduced to Word World when I was at another Moms house. her kids were watching it and it was after I had been working on letters with my daughter. She said ‘e’ and there was an e. I was so excited. The other mom said she loves Word World because it brings back memories of when she used to make pictures out of words. The only one I ever did was boy or girl. She had a larger imagination than I did and so did the creators of this show. I love watching Word World too. It comes on PBS and is put out on DVD’s by NCircle Entertainment. 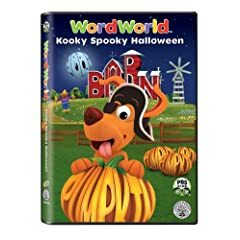 NCircle was kind enough to send us a preview DVD of WordWorld: A Kooky Spooky Halloween to review. It’s a great DVD, it only has two episodes on it so it’s just a little short. All the characters need Halloween costumes and one of the characters accidentally scares all the rest. 😉 You’ll have to watch it to find out. I have not seen Word World but it sounds like something my 4 year old grandson would like. The Halloween one sounds really cute and the holiday theme will be an interest catcher.